Our prison programs focus on improving levels of safety within prisons and with wider strategic priorities for reducing re-offending and addressing the poorer outcomes experienced by young women and men. The Safety Box ® Aspire Higher Program is a holistic personal development program designed to change behaviour traits and negative mindsets. It uses advanced coaching methodologies and a refined system of training and development in helping youth and adults to develop important life skills such as leadership, communication, team work, relationship building, presentation, conflict resolution, violence reduction, money management, business basics, personal development and problem solving. We recognise that these are some of the essential keys to success. They open doors to learning, to life in addition to work. They are a platform on which to build employability skills and the gateway to future well-being and prosperity. In our program we aim to improve the levels of safety within prisons and with wider strategic priorities for reducing re-offending and addressing the poorer outcomes experienced by young people and adults who don’t normally engage in employment or education within the estate. We use a combination of evidenced based methodologies which compliment each other and have a proven track record of working within the custodial setting and within the community. All our workshops are delivered by dynamic facilitators and the workers are labelled as being “credible messengers” (those with experiences of achieving great success after formally being involved in violence, gang affiliation and or offending behaviour). This allows for a cognizant connection with many of the participants and an approach which leads to a potent peer led program. The Program runs for 5 full days (2 days / week), 3 days are delivered as group workshops and two days are focussed on one to one coaching and therapy sessions where if the candidate has experience trauma this is identified and sign posted to a specialist. The program utilizes reflective practice and seeks to test the impact of peer to peer mentorship in increasing awareness of the living with better values outside of the intervention. The program is inspirational, impactful and empowering. It utilises the following methodology of engagement. We believe that the greatest impact is found when the entire community understands the intervention and works in partnership. We therefore encourage a multi-level approach working with both prisoners and staff. We develop a rehabilitative culture by training and developing both staff and prisoners and embedding values, behaviours and attitudes within all members of the prison community using innovative solutions which are of benefit to young, violent offenders. Post program deployment we provide learning that will help, inform and enable development of a whole prison approach to working with young, violent offenders. Reflective practice is a key component of our training and a necessary element which is used to better manage situations. Increased cultural competence among prison officers and staff groups within the prisons is something which we also focus on which supports the development of a rehabilitative culture within the estate. To facilitate a change in thinking and ultimately behaviour within the estate and outside once released. Development of more inclusive services which better meet the diverse needs of the prisoner cohort based on increased staff awareness of the impact of discrimination, the susceptibility to bias and greater cultural competence. Reduction in violent incidents amongst selected cohorts of high risk offenders and a more general reduction in violence, use of force and anti-social behaviour as a result of the staff training. Positive changes in attitudes and behaviour from both staff and prisoners which reduce risk of harm to self and others and improves the opportunities for rehabilitation. Improvements in the resilience of staff through increased understanding and empathy for the young men in their care leading to improved retention rates. Viewing violence through the lens of public health, The Safety Box employs an evidence-based model, proven to reduce violence in different cultural contexts. The Safety Box in partnership with Cure Violence & Surviving Our Streets successfully implemented this model for the first time in a UK Prison, this was a slight adaptation from the Cure Violence USA model into a UK YOI where the group violence reduced by 96% in one year. Social norms, the expectations of an immediate peer group are the greatest indicator to predict how an individual will respond to a given situation, including whether or not they will react violently when “feeling” threatened, insulted, or wronged. Furthermore, the greatest predictors of violent events, regardless of the specific political, religious, social, or economic motivations for violence or how it manifests (tribal conflict, militia warfare, street gangs) - are prior events. Just as nothing predicts a case of influenza, as exposure to a prior active case of influenza, nothing predicts a violent act as accurately as a preceding violent act – committed against you, someone close to you, or to your group. By employing a pioneering epidemiological model, the Safety Box model is unique in the approach we take to handling violent behaviours and causing a mindset shift. The Safety Box Violence Interrupters (VIs) are specifically recruited individuals that are identified as credible messengers with those active in serious street/gang related violence. Traditionally but not exclusively they are ex-gang members or individuals with violent offending in their past who are highly respected and listened to by their peers. They will be trusted by and able to build rapport with our client market. Our Violence interrupters employ high-risk conflict mediation techniques to mediate conflict, stop retaliations, pre-empt and stop violent incidents occurring. Once a conflict with the potential to lead to violence or further violence as the case may be has been identified, the Vis will be deployed to mediate/interrupt the conflict. It is worth noting that due to the networks our VIs will have on the ground level it is expected that in many cases they will be the first to know of incidents that could lead to violence as they occur. The Safety Box Founder, Nathaniel Peat speaks on Violence Reduction within the estate at the Youth Justice Convention, December 2015. 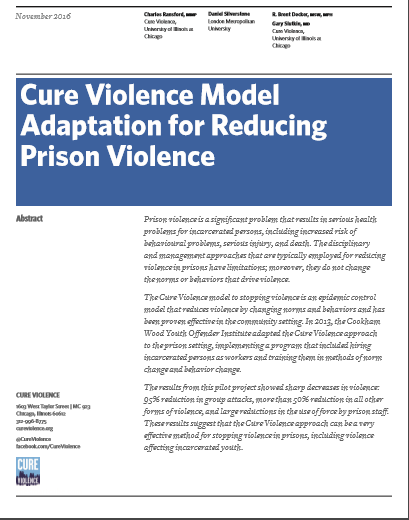 The Safety Box was invited to develop program content for the adaptation of Cure Violence methodology in a UK YOI prison. The data can be seen below where group violence was reduced by 96% in one year. HMP Elmley has seen a rise in violence since the start of the 2017 year, both in relation to prisoner and staff assaults. In response to this, the prison engaged a the partnership of The Safety Box & Syrus Consultancy CIC, to deliver the Aspire Higher programme, a bespoke programme for those individuals who are responsible for a high proportion of this recurring violence.